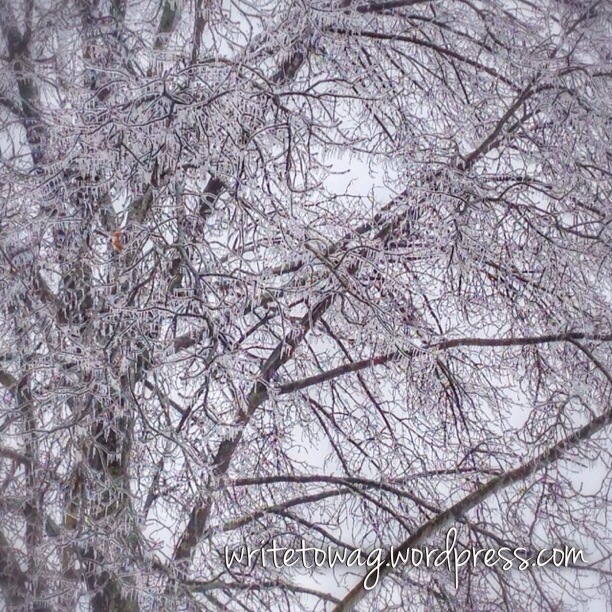 Well, another ice storm came into the Music City on Sunday night and this one was intense. 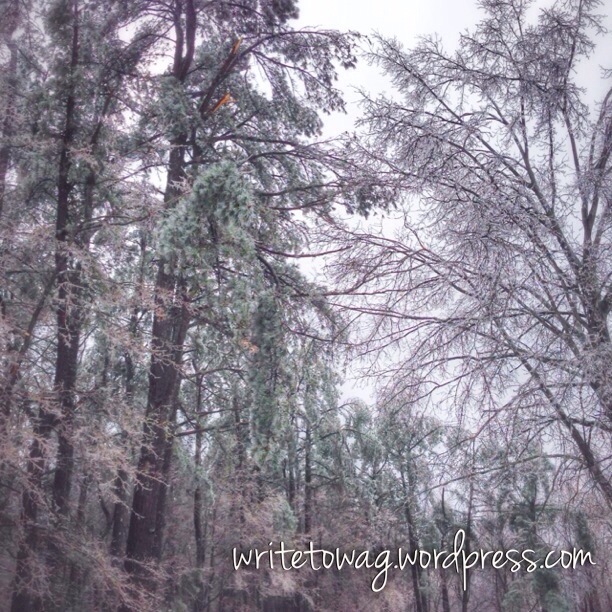 Our backyard is lush with large old trees and after a couple hours into the ice storm, they started to tumble. It started with the twigs, then the limbs and some of the big ones just couldn’t hold the weight of the world any longer. Even with all the damage, everyone has remained safe and that is all that really matters. Thank You, Lord!!!! The landscape sure was beautiful though. Hope you enjoy!!!! Time to tend to some frosty perfect paws!!!! Many barks and blessings for a wonderful day!!!! So happy everybody stayed safe. Ice is so scary! Great pictures. Thank you sweet Cupcake!!!! I truly appreciate your warm words…it was wild Sunday night!!!! 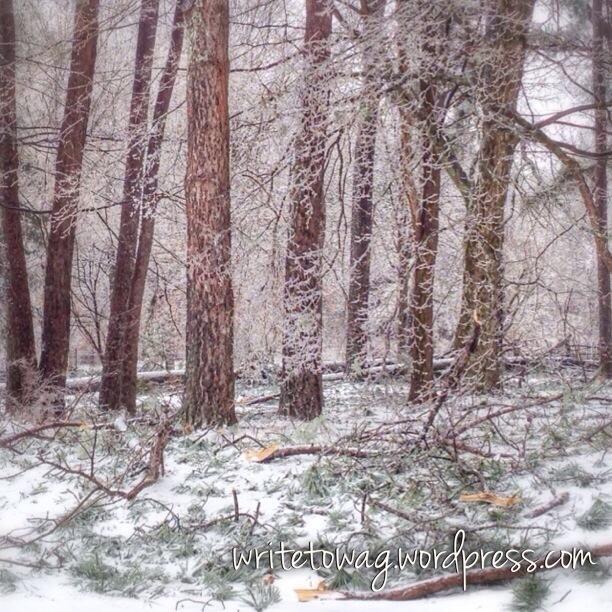 Maybe things will start to melt in Wednesday….Hope you and your mom have a wonderful day!!!! Big hugs always!!!! I am so sorry that Mother Nature caused so much damage to your beautiful trees, but very thankful that everyone is safe. That Mother Nature has been a very cruel woman this winter. 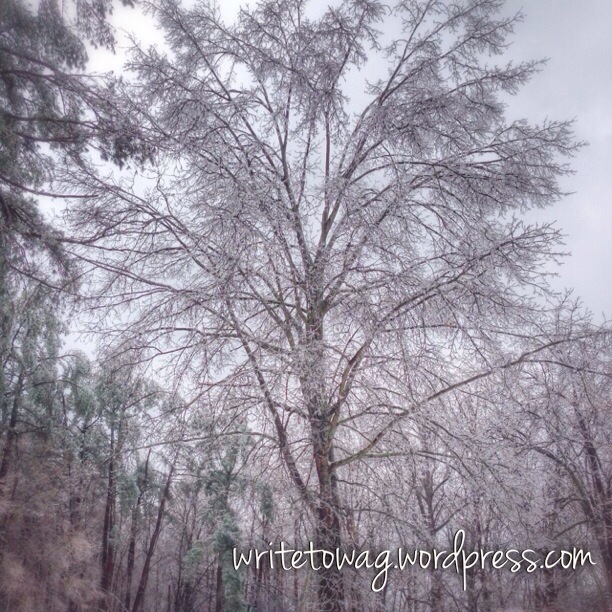 We’re having our fourth ice storm today. Please . . . it’s March and I live in the South. This can stop any time now! Oh, honey I know it!!!! Please stay safe and warm and I hope the storm passes quickly…The back roads are ice, main roads clear, it’s just getting to them….This winter has been wild, Sunday night was so scary…God bless you and yours!!!! Big hugs always!!!! Sometimes nature at it’s most beautiful is also it’s most dangerous. Glad everyone is safe and thank you for the gorgeous photos! You are wonderful!!!! Thank you for your sweet words!!!! Happy day to you!!!! Sometimes nature at it’s most beautiful is also it’s most dangerous! So glad everyone is safe and thank you for the gorgeous photos! Awwww….thank you for your warm words…so need them…Wednesday brings the warm up, so until then we are stranded…enjoying our day together, naps and cuddles!!!! Have a wonderful day my friends!!!! 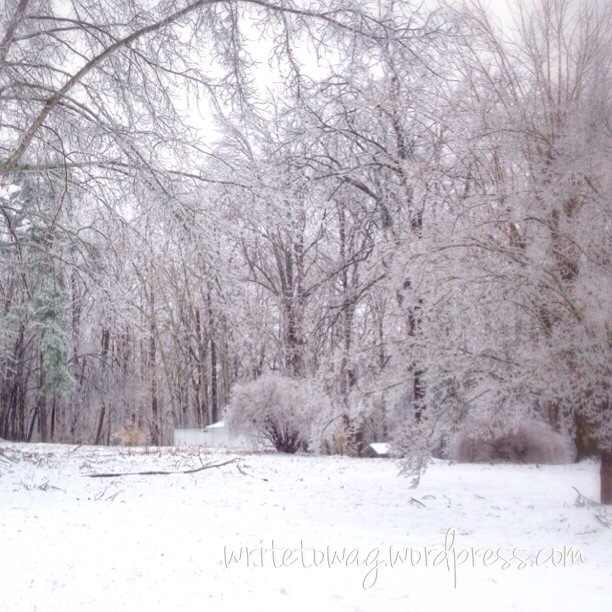 Heavy snow and ice storms are so very beautiful, but they sadly do so much damage. Glad you don’t have house damage. Thanks Emma!!!! The back roads are a solid sheet of ice, interstates are clear though…Maybe things will thaw tomorrow…Have a pawesome day friends!!!! 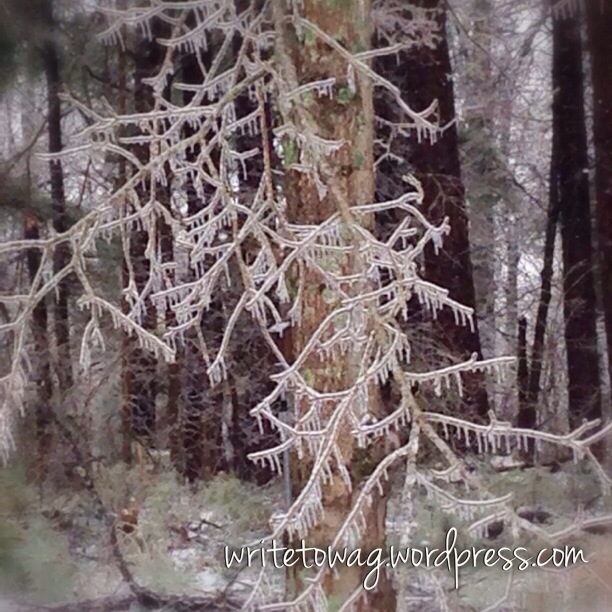 We had snow but no ice thankfully……..I’ve always liked to photograph the ice on tree limbs, etc. but that’s about the only way I like the stuff (except as cubes in lemonade perhaps!!). 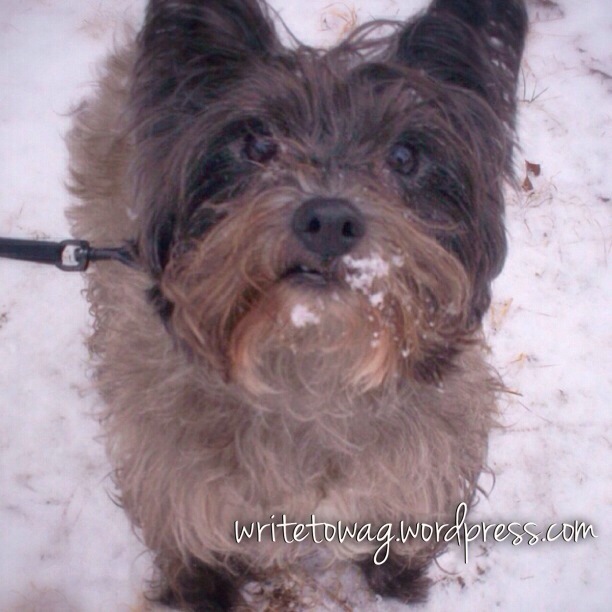 Good thing you don’t have icicles hanging from your cute nose Trev! Hi there my friends…Wednesday is the warm up…Thank The Lord!!!! Stranded for today, so enjoying the time together!!!! That is always such a blessing!!!! Hugs and love to you both…Glad you are back from the moon now!!!! You have it pretty there too. Don’t know about you, but I am so ready for Spring! Shew, I so am!!!! 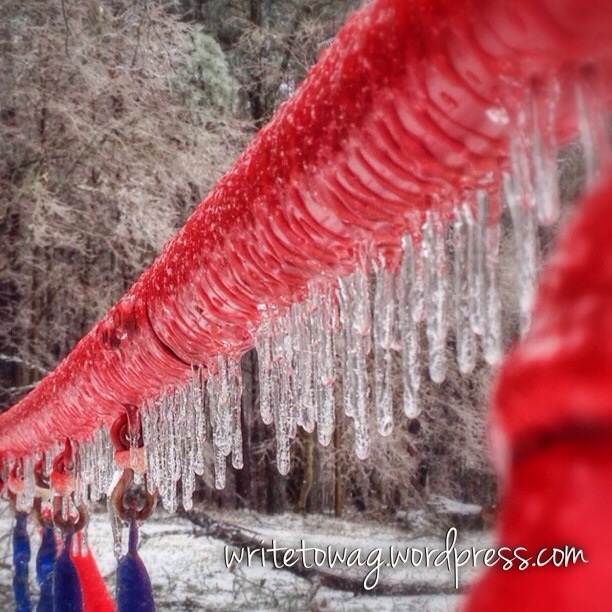 The back roads are still coated in ice…interstates are clear!!!! Wednesday is bringing warmer temps so maybe things will get back to normal then…giggles!!!! Please stay warm and safe!!!! Oh wow! Beautiful photographs. So pleased everybody was safe, never fails to amaze me how something so beautiful can be so destructive. Thank you Carrie, Myfie, Ellie and Millie!!!! Sunday was a sleepless night and oh so scary…we are ready for warmer temps!!!! Have a great rest of the week friends!!! Oh, I know it!!!! Spring, we are ready to see you!!!! Beautiful shots, glad all parties are ok. Now that you’ve captured her winter beauty, maybe Mother Nature can hurry it up with spring! Shew!!!! We so agree…Sunday was a scary night…so looking forward to warmer temps!!!! It’s global warming, I tell you. It’s a good thing that the cactus don’t fall over in 70 degree weather. Stay safe back there. Thank you Kyla!!!! We appreciate that!!!! Have a wonderful rest of the week!!!! Thank you sweet Misaki!!!! Have a pawesome day!!!! Although it looks like a magic world it can be really dangerous. I’m glad you are safe. If I see Miss Spring I will send it you first, it’s cold here too, but I have a warm blankie and we fortunately have no snow. Easy…you are a true sweetheart!!!! Thank you for your kind words!!!! Stay warm and cuddled up friend!!!! beautiful pictures! I especially like the last one! Awww…thank you Leah and Kirby!!!! Hope your day is wonderful!!!! Thank you very very much!!!! Have a wonderful rest of the week!!!! Thank you so much!!!! It’s finally melted and the weather is warm and gorgeous today!!!! Have to enjoy it while we can!!!! BWAH!!!! Happy weekend to you!!!! I just love your snowy little mustache! Thank you so so much!!!! Big hugs and happy weekend!!!! EEoww Trev Bear dat iz bery scarey…all dat ice…n da treez holdin da wait of da werld…it iz so sad when old treez come down…or young onez too…we iz so glad eberyone is safe n no one hert. Ya look a bit chilli in da photo so we hopez ya got inside n warmed up quick!!! Thank you so much sweet Nylablue!!!! Much love to you and your mom!!!! Yer wellcome Trev Bear!! We lub ya! Whew, glad you stayed safe inside and weren’t out there with all the trees. Thank you so much!!!! Spring is finally here…Hugs to you!!!! Mr. Trev, careful quality control, sampling the snow. I hope we have seen the last of the snow and cold. Shew, you ain’t a kiddin’!!!! Hope this warmer weather lasts for at least a little while!!!! Happy Saturday!!!! Hope your lab is smelling sweet again…. Hi there Dennis!!!! 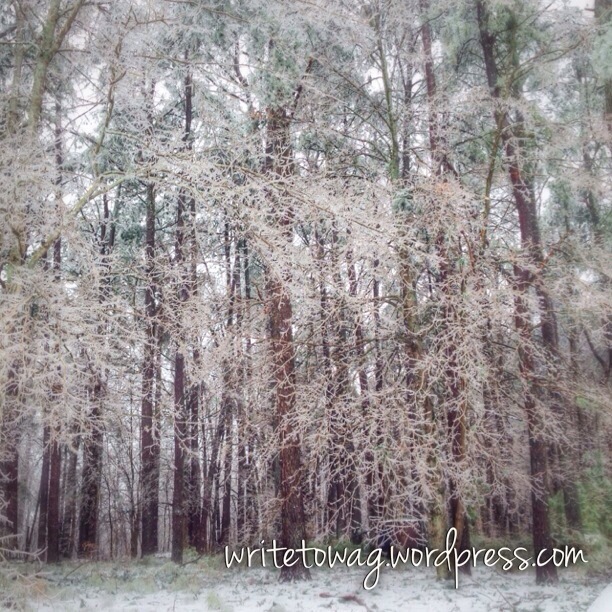 So great to hear from you…Yes, the ice storms are so very scary…Thankful Spring is here now…You are very lucky to not have to deal with those storms!!!! Have a wonderful week friend!!!! Oh Bill, thank you for visiting us today!!!! We would enjoy living in a warm climate, it’s true…That particular ice storm was so scary, with trees and branches falling like rain…Spring is here now and we have to brave all those allergens…I’m sure living in FL, allergies are tame if at all present…We send love and hugs to you and yours and hope the rest of your week is wonderful!!! !